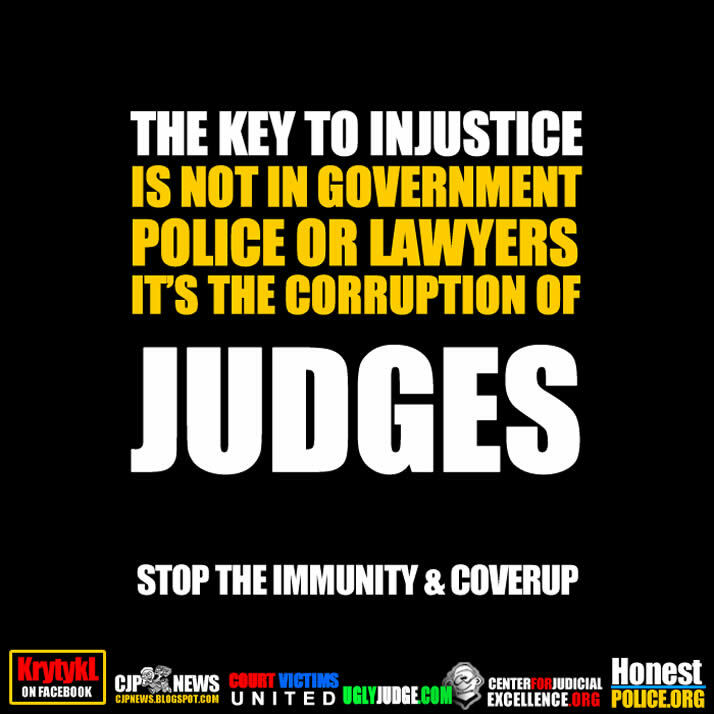 When one goes to court with evidence, witnesses and documents all proving crime, abuse or wrong only to find out the judge ignores it all you realize how bad our courts have become. The fact is the commission on judicial performance; the legal bars are all just fronts that help cover up these crimes by pretending to be images of protection. It’s a huge scam and conspiracy made up of lawyers. They’ve taken the crime of “ambulance chasing” and made it into “business as usual”. This is the way of Harvard and the legal bars create legal fees no matter the cost of life, family, morals or law. Law is to be twisted any way you can as to make a profit. Then abuse the statute of limitations to get away with it. The system is obviously broken; once you’ve been victimized you realize just how bad it really is. The unbridled power of a dishonest judge allows them to manipulate their muscle i.e. authorities to aide them in their crimes and abuse as the federal government ignores your cries and reports of violations. In the years that followed, Besen’s hopes for an equitable settlement dwindled as she battled a series of harsh and hard-to-explain decisions against her. Though she could never prove anything, she suspected that the scales had tipped for reasons unrelated to the evidence in her case. If true, Besen faced what experts say is one of the most troubling threats to our nation’s system of justice: judges, who, through incompetence, bias or outright corruption, prevent the wronged from getting a fair hearing in our courts. Judges in local, state and federal courts across the country routinely hide their connections to litigants and their lawyers. These links can be social – they may have been law school classmates or share common friends – political, financial or ideological. In some instances the two may have mutual investment interests. They might be in-laws. Occasionally they are literally in bed together. While it’s unavoidable that such relationships will occur, when they do create a perception of bias, a judge is duty-bound to at the very least disclose that information, and if it is creates an actual bias, allow a different judge to take over. All too often, however, the conflicted jurist says nothing and proceeds to rule in favor of the connected party, while the loser goes off without realizing an undisclosed bias doomed her case. Hundreds of judicial transgressions have been uncovered during the last decade, with results that cost the defeated litigants their home, business, custody, health or freedom. Some of the best-known cases involve judges who ultimately did suffer consequences for their behavior, including Texas judge Christopher Dupuy, who bullied four lawyers who filed conflict-of-interest recusal motions between 2011 and 2013. Attorney Lori Laird asked that Dupuy bow out in 2013 because she’d represented Dupuy’s ex-wife in the couple’s custody battle in Galveston. The judge responded by slapping her with 37 counts of contempt, demanding that she “explain, defend or apologize” for her motion. He later sentenced her to 220 days in jail, although she didn’t serve any time. “It was the most ridiculous thing you’ve ever seen,” Laird told Contently.org. “It also caused great damage to both of my clients.” Dupuy was admonished in November – after he’d already retired and was sentenced to two years’ probation for pleading guilty to misdemeanor counts of perjury and misuse of government property. But court critics say that one reason judicial violations are common is because they frequently go unpunished. When litigants ask a judge to back away because of a conflict, they risk being told no, then face possible retaliation, so many don’t bother. If a litigant or an attorney files a complaint with an oversight body, there’s only about a 10% chance that state court authorities will properly investigate the allegation, according to a Contently.org analysis of data from 12 states. The analysis shows that a dozen of these commissions collectively dismissed out of hand 90% of the complaints filed during the last five years, tossing 33,613 of 37,216 grievances without conducting any substantive inquiry. When they did take a look – 3,693 times between 2010 and 2014 – investigators found wrongdoing almost half the time, issuing disciplinary actions in 1,751 cases, about 47%. The actions taken ranged from a letter of warning to censure, a formal sanction that indicates a judge is guilty of misconduct but does not merit suspension or removal. Click To Learn MoreActually removing a judge was a rarity. Just 19 jurists in 12 states were ordered off the bench for malfeasance, which is about three per decade for each state. And even that result is becoming less common, with only one removal in 2014 and three in 2013 among all 12 states. The states examined – California, Texas, New York, Pennsylvania, Connecticut, Wisconsin, Indiana, Minnesota, Colorado, Washington, Georgia and South Carolina – were chosen because they comprise a representative sample from different populations and areas of the country and because they had matching data for the years 2010 through 2014. California, which created the first judicial disciplinary body in the country in 1960, had a dismissal rate of 98%. It did not suspend or remove a single judge in 2013 or 2014 and acted just once over the last five years, removing a sitting judge in 2012. Colorado’s lone judicial action since 2010 was a suspension in 2013. Texas has not removed a judge in five years, though it has suspended 23 for varying lengths of time. One discouraging factor is the secrecy under which these commissions operate. Allegations against a judge are commonly kept confidential unless a sanction of some kind is imposed. New York’s CJC, for example, is prevented by law from disclosing whether anyone has complained about a judge, discussing specific allegations, revealing what evidence might have been presented or what steps, if any, it took to investigative. When conduct boards do act, the sanctions usually amount to an admonishment that may be embarrassing but costs the judge little. Among those still on the bench after ethical violations are Louisiana judge Robin Free. Free oversaw a personal injury claim in 2010 by a man and his wife, Israel and Leslie Robles, who were hurt in an oil field run by Houston-based fracking contractor Integration Production Services, Inc. The trial had begun when the two sides agreed to a $1.2m settlement. As he mulled signing off on the deal, Free arranged for some post-trial R&R at Casa Bonita, a hunting and fishing ranch in George West, Texas, owned by the victims’ lawyer, David Rumley. He flew there aboard the Rumley firm’s private jet. It wasn’t Free’s first ethical blunder. In 2001 he presided over a fouled-water case against Dow Chemical, trying to resolve the matter even as his mother was a member of the plaintiff’s class. Free is still serving on the bench after being docked 30 days pay in December and forking over a $6,723.64 fine. How Corrupt Is America’s Judicial System?